Many Unix, Linux, and Mac OS X geeks enjoy using the powerful, platform-agnostic text editors vi and Vim, but there are far too many commands for anyone to remember. 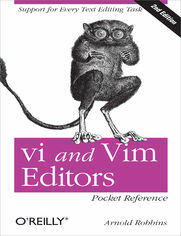 Author Arnold Robbins has chosen the most valuable commands for vi, Vim, and vi's main clones—vile, elvis, and nvi—and packed them into this easy-to-browse pocket reference. You'll find commands for all kinds of editing tasks, such as programming, modifying system files, and writing and marking up articles.